Be you because you can't be anyone else. Sometimes, you deserve a gift. Sure, you’re browsing presents to buy for someone else but maybe it’s time you treat yourself. This playful pendant will add a sophisticated yet fun touch to your favorite outfits. The circle, which is often the spiritual representation of wholeness, shows that you are a complete package. You hold the key to your own happiness. 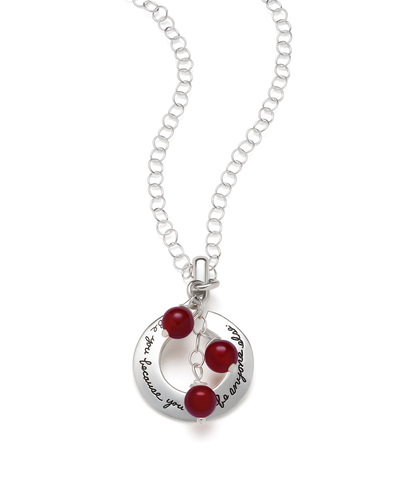 Three red citrine stones dangle from the sterling silver chain. Red citrine is the perfect stone to represent, “me, myself, and I.” The bold stones radiate joyful energy and magnify personal power. Many people call red citrine “the success stone” and count on it for good fortune. Wear this hand-polished sterling silver creation anytime you need a little pick me up. It may just become your personal lucky charm.